Danish, pianist, Nikolaj Hess has performed and led various size groups. One of the more effective and resonant groups for me (outside of solo) is his trio line up. While it can sometimes vary in membership, the aesthetic value is always the same--emotional, subtle and long-lasting. 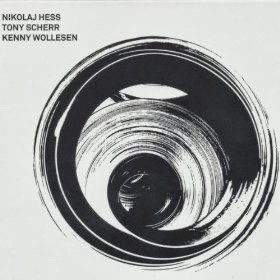 For this simply titled Trio album, Hess is joined by Tony Scherr and Kenny Wollesen. A quiet and reflective session that opens with a wonderful rendition of Bob Dylan's "Make You Feel My Love." Stripping away the already fantastic vocal from the original you realize how much of the impact the songs can actually have. And it is brilliantly executed by Hess. His notes seem to hit the heart with every touch. "September 2010" is a gentle midtempo piece that evokes the soothing pictorial view of autumn. A laid back bop approach that easily settles with an evening skyline. Adding a little bit of a groove into the mix is "Kontra" which sees the bassline and drums hitting a different step. Hess manages to mix in both some modern lines and notes into this composition that reminded me of some of the more eccentric work of Jason Moran. "Social Club" is another midtempo piece but with a little joyous romp to it, interspersed with some nice improvised pieces. A nice, fun and creative way to end this enjoy journey. Trio is beautiful recording that is quick to catch the ear of any music fan. The impact of Nikolaj Hess' compositions will definitely touch you. It's one of those record that you'll end up listening to constantly without even realizing it.